San Diego Comic-Con is getting nearer, and day by day we’re getting to see more of the exclusive goodies that will be available at the convention. Sometimes, they delight us. In this case, they scare the living bejeezus out of us. 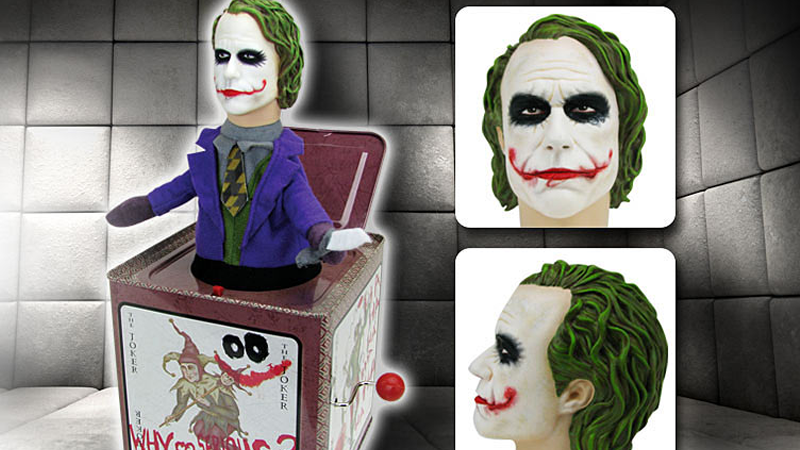 Announced by retailer Entertainment Earth as one of the many exclusive toys they’ll be bringing to SDCC, this retro-style The Dark Knight Jack-in-the-Box replaces the traditional jester for Heath Ledger’s deranged take on the clown prince of crime. Which would be creepy enough, but man, the actual look of the damn thing is still a lot scarier than it has any right to be. Just look at the distant eyes. The uncomfortably oversized plastic head. The little plush knife he’s carrying to come cut you up. Did not need that imagery in my head this morning, thank you very much Entertainment Earth. If you would like to traumatize yourself and/or display your affection for Ledger’s take on the Joker, the 5.5-inch-tall toy will set you back $50 at Comic-Con. But you can also purchase it online alongside all of Entertainment Earth’s other SDCC exclusives—although those orders are dependent on stock being left over after the convention.